As you know, my scalp can be evil. It will flake out for no good reason or it will behave. Why it does what it does is a mystery to me. Too much shampoo, flakes. Too much co-washing, build-up. Too little shampoo, build-up. Too little co-washing, flakes. Sigh. Understanding the minds of men is easier than understanding my scalp and its idiosyncrasies. Last week, my scalp was acting up because of sweat. On Friday, when I almost missed my meeting that the job flew me to the other side of the country for (I still sweat thinking how close I was to missing that meeting. I would have been unemployed, ya’ll, with plenty of time to blog about hair), I was sweating up a storm. By Friday afternoon, my scalp was biting and itching. Being far away from home and not wanting to buy products and do the ‘do when there was all of Vancouver to explore, I decided wait until Sunday afternoon when I was back home. I parted my hair and massaged the mixture into my scalp, making sure to get the very itchy and uncomfortable spots. It felt SO good! It was tingling and the sugar was rough, but not rough enough to hurt or break the skin. My sister dropped by and I chatted with her for a half an hour and then spent another half an hour watching the American government fight through the health care reform bill (that was pretty interesting, actually). After that, I rinsed my hair with warm water and lightly washed with Country Rose Soap Co.’s liquid shampoo. I had quite a bit of the scrub left when I was finish scrubbing my scalp, so I decided to use the rest of it on my body. HEAVEN! My skin was so smooth and soft — just lovely. Why buy a $20 product from Bath & Body Works when you can make your own for pennies? And if you know that you have sensitive skin, you don’t have to worry about ingredients that may give you a reaction. A win-win situation as far as I’m concerned. I conditioned with heat using Kimble Hair Care Systems’ Ginger Cream Conditioner, which I’m liking quite a bit (review to come). Finally, I used Giovanni Direct Leave-in conditioner and moisturized with Carol’s Daughter Hair Milk. One thing that I forgot to do was oil my scalp with my castor oil/olive oil mixture. My hair was very soft and my scalp felt clean — but it usually feels clean after a wash. It’s a couple of days out that is the true test. 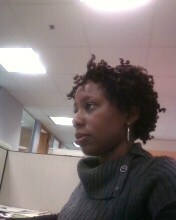 I two-strand twisted with Darcy Botanicals’ Avocado & Honey Twisting Cream and am now rocking a twist-out. So, today is Day 3 and my problem spots are still giving me problems — I think that has something to do with forgetting to oil my scalp — but I did very much enjoy the scrub. I think I’m going to try it again and remember to oil my scalp. I think it’s a good exfoliant — as long as you don’t skip your usual steps, like oiling up that scalp. Next time, I think I’m going to try it with tea tree oil. I heard that that essential oil can combat dandruff and scalp problems. I make a similiar scrub for my body. http://bit.ly/b4xgz4 I never thought of using it in my scalp. What a great idea! I’ve never tried Country Rose Soap Shampoo or Darcy Botanicals’ Avocado & Honey Twisting Cream. Are they all natural? Country Rose Soap Co.’s liquid shampoo is all natural — saponified castor and olive oils, which is great for me because I’m allergic to coconut and lots of shampoos — especially castile soap have a coconut oil base. Darcy’s Botanicals is also all natural. I’m going to check out some more products in their line. I smelled the vanilla styling cream. Yum! I’m actually taking out my braids in a few weeks, and I have to figure out what I’m going to do. And thanks for the link/reminder of Roshini. I had used to read her blog, when I was wearing my hear natural in 2005 – I’ll have to take a look around again.